By registering A4DeskPro Flash WebSite Builder, you can remove all A4DESKPRO LOGO, BUTTONS & REGISTRATION SCREEN from your selected flash template(s). If you have not used A4DeskPro software before , you are welcomed to download the latest free trial version from Download Page. Best choice for creating multiple websites and maximize your options. Build unlimited websites at 1 fix price. Host website anywere. The websites you created are yours to keep. When the subscription plan expires, you can CONTINUE to open and update the site content of your previous projects. You only need to renewal the subscription plan for creating new websites or download new templates. You only need to renew the subscription plan for creating new websites or download new templates. Upgrade to A4DeskPro at discount price. * Your purchase or use of our products implies that you have read and accepted the End User License Agreement. 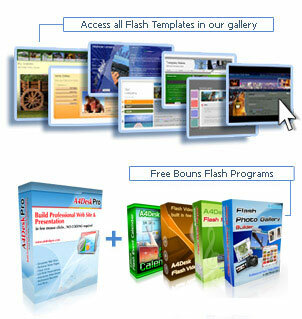 Get ALL A4Desk flash softwares & SAVE 50%!